At the 2018 Unitarian Universalist Association General Assembly, delegates affirmed an Action of Immediate Witness calling for solidarity NOW with Indigenous water protectors, pledging “our direct and tangible support for local Indigenous movements that seek to protect the environment and restore traditional Indigenous ways of life” and committing to “extend relationships of solidarity with Water Protectors, leveraging our spiritual, financial, human, and infrastructural resources in support of Water Protectors”. One way UUs can lean into solidarity is to support the #NoPipelines #RiseTogether Weeks of Action taking place from July 16th through 31st. 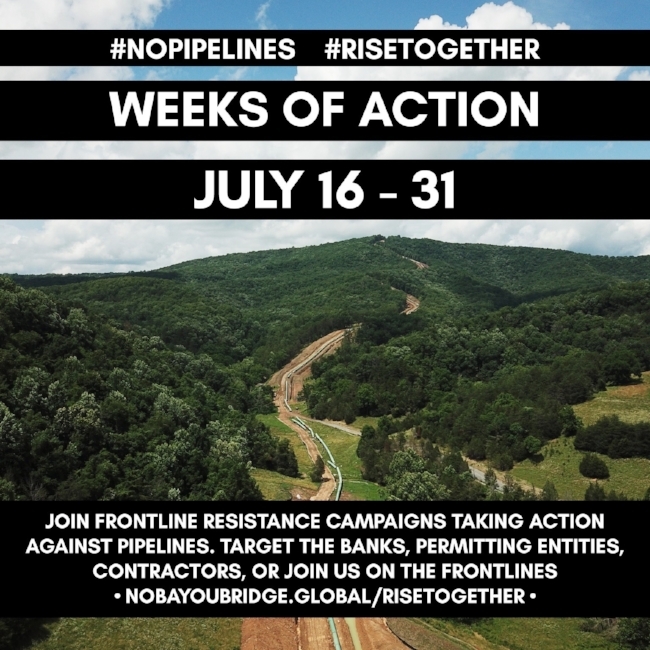 [From their Call to Action] From July 16th-31st frontline resistance campaigns across the continent will be taking action simultaneously to stop pipelines and extreme energy projects. During these weeks of action, we are calling on people to join us in solidarity by organizing actions targeting the banks funding these pipeline projects, or by joining the frontlines and taking action directly with us. UU Ministry for Earth endorses this call to action and encourages UU individuals, committees, and congregations to engage with and support local actions as part of this campaign, and as part of collectively living into UU solidarity with Indigenous Water Protectors.